The AIBs continue to grow, having attracted a record number of entries in 2018. In 2019- the 15th year of this internationally respected competition - we're expecting even more as the reach of this global festival of excellence in factual content increases. These prestigious international awards attract entries from broadcasters, media companies and independent producers the world over. Each organisation is keen to showcase its output and on-air talent to the world, and the AIBs are an ideal platform to demonstrate a company’s expertise. The AIBs are also an ideal vehicle for companies who want to reach the global media community. That’s why each year, AIB offers a limited number of partnership opportunities that provide companies with up to nine months of brand exposure to more than 27,000 media leaders – executives, technologists, editors, producers, journalists – across the world. 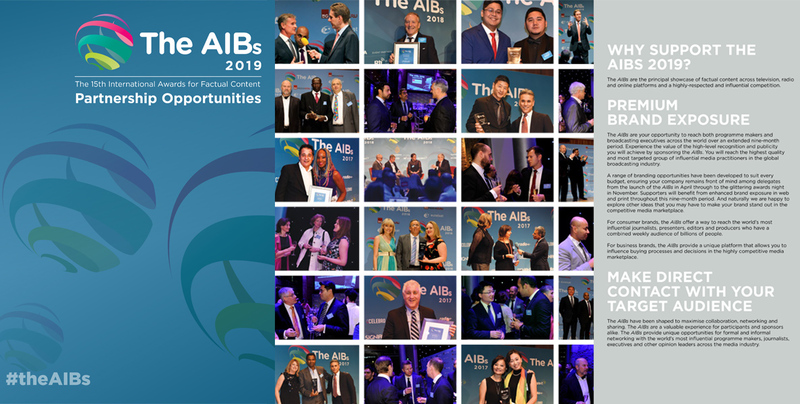 Supporters who sign up for the AIBs 2019 will gain maximum benefit of constant brand exposure in more than 150 markets worldwide from now through to the awards ceremony itself to the showcasing of the winners and shortlisted entries in our Winners and Finalists book available online to our international community. Call Tom Wragg today on +44 7740 411457 to explore the potential.